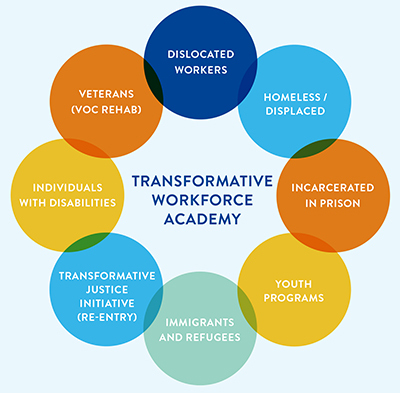 The goal of the Transformative Workforce Academy (TWA) program is to improve the Saint Louis community and make jobs and training available to disadvantaged populations. A large Metropolitan area such as St. Louis contains population groups that face significant obstacles to employment, and the Saint Louis University TWA program can play an important role in helping these populations find and secure jobs. The population groups include: Dislocated Workers, Single Parents, Incarcerated in Prison, Youth Programs, Immigrants and Refugees, Re-entry Program, Individuals with Disabilities and Veterans. These populations provide an opportunity for Saint Louis University to put its Mission statement to use in a practical manner, and many of the concepts/programs are transferable to other groups. Develop custom educational programming that meets the needs of these disadvantaged groups. Provide job placement services. Recognize that job placement will be a significant milestone. Support job maintenance as an important end goal as well. Grow networking opportunities to increase immersion in the workforce ecosystem. Form symbiotic relationships with key partners and determine how to best serve unmet needs. Develop and support outreach programming such as job fairs, corporate job internships, business ownership, organizations or “pledge companies” that commit to hiring and supporting hires and mentorship programs for supporting the individual and the hiring companies. Click for more information about the Personal Development and Workforce Readiness Bootcamp.